The opportunity to angle must never be regulated away! All management of our sports-fishery must have a bottom line, a point beyond which there is no return. For the angler that bottom line must be the preservation of the opportunity to fish! 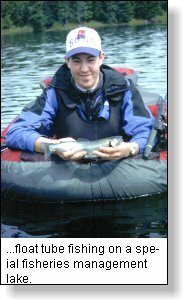 The current west coast coho issue/crisis suggests that we may have to agree to a closure on angling for coho salmon. I must be vocal and state that I feel this kind of sports fishing regulation should be greeted with a resounding, "NO!" I firmly believe that above all else, the opportunity to angle should never be regulated away! Regulations must obviously reflect the current state of the resource but, there are many levels of regulations, many options that can cater to the needs of a specific fishery before the signs read - "NO FISHING!" Many years ago, in the early seventies, steelhead were facing a serious decline. Regulations had dramatically dropped limits. They changed from two per day, to forty per season, then to ten per season. Now we have a necessary 'no-kill' on wild steelhead in certain regions of the province. But, we still have the opportunity to angle! A similar situation faced steelheader anglers these past two years with another drastic decline of winter steelhead on east coast Vancouver Island streams. 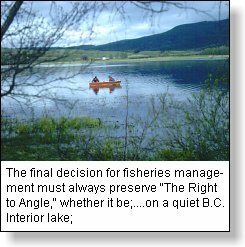 It is to the credit of the provincial Fisheries Branch that after much public discussion they choose to leave a lower section of each river open to fishing, �to preserve the right to angle'. In those early 70's specific stocks of steelhead were facing drastic declines and provincial fisheries managers were faced with the ultimate regulation; eliminating a sports fishery on one of the most threatened rivers,the Heber River, by placing a total fishing ban on this watershed. 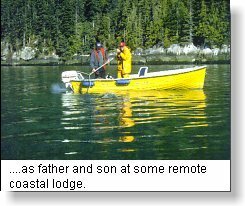 But, to their credit, after much discussion with sports anglers, they imposed instead a 'catch-and-release' fishery on this watershed, the first such regulation in British Columbia. It was highly successful and led to 'catch-and-release' as a management option being used throughout the province. I would also suggest that this foresight had much to do with the growth of the current social attitude of steelheaders which sees well over 70% of all steelhead in B.C., wild and hatchery, being released voluntarily. 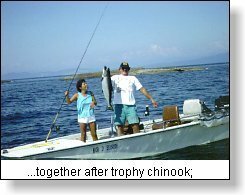 A decade ago, Federal Fisheries were faced with a similar situation based upon a 'chinook conservation' plan. Unfortunately, their decision, Fin-Fish closures, not only eliminated a sports fishery but also eliminated all sports angling. For shame, it was a regulation which took away the opportunity to angle. I have spoken out against this inane irresponsible regulation since its inception but sadly no change has occurred to this loss of our sport. It is interesting to note that since the inception of �fin-fish' closures DFO has yet to study the affect of these punitive closures. But, there is some understanding in DFO. To their credit, when faced with the need to regulate the sports catch of �blueback' coho salmon, rather than impose a coastwide closure on all fin fish angling they instead imposed a size limit. This protected our inherent right to angle. "To begin, I suspect that sport fishing for salmon will become more of a yearly religious festival than an every weekend pursuit. To take an extreme position, I can visualize that by the year 2020, for a short 10 day period in midsummer, hundreds of thousands of sport fishermen will be allowed a total catch of two salmon each, and these will be prepared for eating with great ceremony and consumed with large quantities of locally made wine. For the rest of the year there will be all kinds of boating pleasure, but no legal sport fishing for salmon." Are we to face Dr. Larkin's tongue-in-cheek projection for our salmon sports fishery sooner than the year 2020, possibly by the turn of the century? I would predict this will be so if we continue to allow Federal Fisheries to apply shameful closures like the current fin fish closure regulation on salmon sports fishing. The right to angle must remain the highest priority for the organized and the individual salmon sports fisherman. If 'conservation' regulations are required then some other form of regulation could be applied as has been historically done in the past. These could include; catch & release, size limits, no kill, reduced limits, tackle restrictions and others. I am sure there are numerous others that I have not listed that could be activated. I have a deep fear of the current DFO 'Fin Fish' closures. We all recognize that they have changed angling patterns and angler habits in the few short years they have been in effect. We also know that these closures have misappropriated a fishery from the sports fisherman whether he be after salmon or other fin fish. Catch and release is a viable management 'conservation' option. To preserve the opportunity to angle, this must be the only acceptable regulation applied to our salmon sports fishery! Yes, it is possible in this era of rapid change that a particular race of fish will require the ultimate in protection - no fishing. When and if this comes to be then no fishing will mean more than just no angling. It will incorporate all the laws needed for an endangered species; laws that affect not just the angler but all who have a negative contact with that race or species of fish. This must include sports, commercial, native, water users, land owners, industry and the political arena. For too long we have lived with political interference, the playing of one user against another when it affects a species or a specific race of fish. The time has come when the dreaded �no fishing' must also mean no species use, no negative habitat use of any kind.